What comes to mind when you hear of Presidential Suites – rock stars or foreign dignitaries e.g. presidents chilling out at super big and best rooms in a hotel? Ever wonder what’s so special about these rooms/suites? 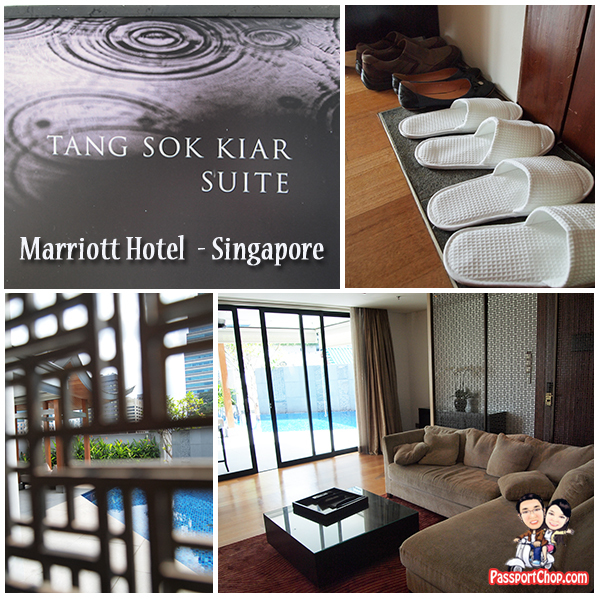 Well – PassportChop.com had the opportunity to enjoy a luxurious weekend over at the Tang Sor Kiar suite in Marriott Hotel Singapore. 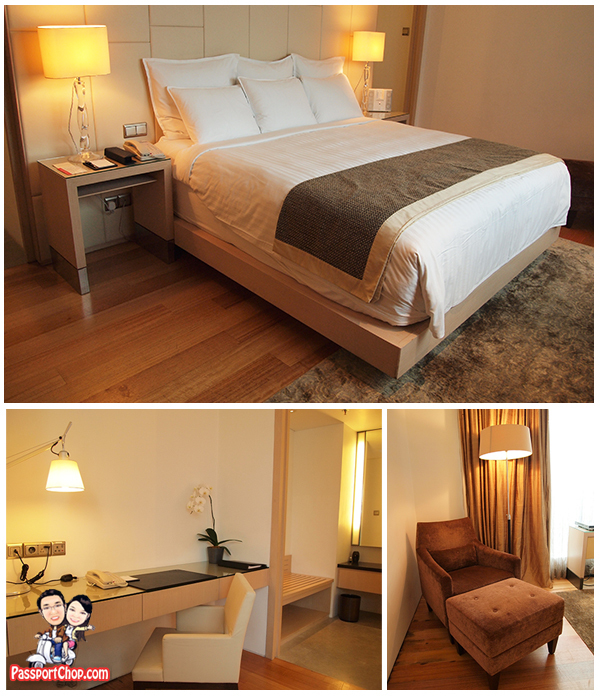 This suite is one of only two such presidential suite in the entire hotel and cost at least S$1800 per night. This post will provide a quick preview of what’s it like staying in such a suite. This is such a unique suite that even the process of getting into the room is very different from other hotel rooms. Located at the 5th floor of Marriott Hotel Singapore away from other hotel rooms, it is about a 3-4 minute walk from the lift lobby and you will be greeted with a front porch and a sign indicating “Tang Sok Kiar Suite”. The first thing you see as you enter is the living room complete with a comfortable sofa, LCD TV and even classy artwork to complement the classy interior design. There is even a pantry with microwave oven and well-stocked fridge of goodies e.g. soft drink, beer and snacks (at extra charge). The amazing thing about this suite is that it comes with a private pool! At just 1.2m deep, it is not Olympic-size but good enough for a quick dip after a hot day of shopping around Orchard Road. There is even a pavilion with comfortable mini-sofa and lounge chair to chill out or sun-tan after a swim. Skinny-dipping is not encouraged though – not a rule enforced by the management but due to construction near the Far East Plaza, workers on site there will have a full view of this private pool and the porch. Besides the comfortable King Size bed in the bedroom, there is also a long office desk, lounge chair and of course, a huge LCD TV for you to chill out to music from your iPod plugged into the room’s iPod speakers or work from the desk with wireless/wired internet (at extra charge). Another very cool feature of this suite is the Vanity Room which is linked to the Bathroom/Shower/Toilet/Sauna. Typical hotel rooms’ vanity corner for make-up, wash-up is typically in the toilet/shower room but in this suite, this is a separate area with 2 sinks at each end of the room with a complete set of shower gel, shampoo, conditioner, soap each. This vanity corner is also equipped with hair-dryer and full-length mirrors. 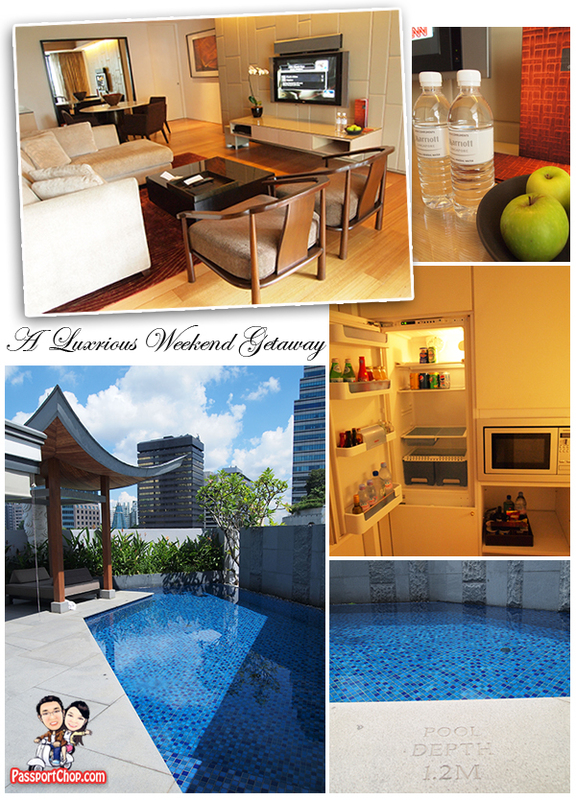 You will also find a huge wardrobe equipped with a safe, bathrobes, iron and ironing board set and even an umbrella. How much is it to rent this room? What are the rates? I think it cost $1200 per night – you will have to check with Marriott Hotel Singapore if they have special rates/promotions. Can refer them to this post so they know which room you refer to. Was just looking around on google today and came across your blog great stuff. Just wanted to take the time and give you some kudos for your work. We are currently on crazy 3 year trip around the world and blog about it come check us out. Well put, sir, well put. I’ll cretinaly make note of that. Your story was really informatvie, thanks! Articles like these put the consumer in the driver seat very ipomratnt. Wow, Really amazing Hotel. The bed, toilet, bath tub are really comfortable. i have never seen like this hotel which i used other hotel before. i like to book this hotel for my honeymoon. Envious is the word. I always wonder, why would anyone need such luxuries for a one night stay. Then again, if I could have them, I would definately want them. Thanks for sharing the pics. This hotel is looking very nice.I really appreciate your blog.It is very informative. posts. Any way I will be subscribing on your augment and even I achievement you get admission to persistently rapidly.